The Last Mideast Peace Conference? Do you think Olmert is sincere? Israel has to make a choice. They have lived for the last 60 years basing their policy on force. Yet they are not closer to achieving peace or security than they have been in the past. It is time for them to try a different policy, a policy of accepting to live with the Palestinians and live in the neighborhood. We don't need a Versailles for the Arab world, a peace that will only be an instigator of future wars. What do you think of Olmert? 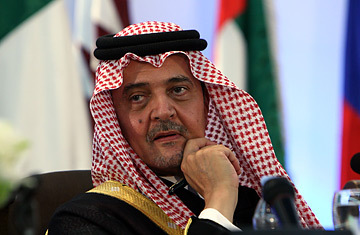 He responded positively to the Arab peace initiative and Saudi involvement in the peace process. Does he accept the principles of the peace proposal totally? Withdrawal for total peace? This will be a test for him in this next conference. Will you try to get to know him at the conference, shake his hand and have a chat? No, this is not theater. We are going seriously for peace negotiations. We are not going there just to take pictures of somebody shaking somebody's hand. We can't give false impressions to people. The hand that has been extended to us has been a fist so far. Once it opens for peace, it will be shaken. Will you avoid shaking his hand if he approaches you? I'm not going to be there for theatrical gestures of shaking hands that mean nothing. You shake hands, and it implies that you have agreed on something. We have not agreed on anything yet. Better than shaking our hands, he should respond in honesty to the proposals that we have put on the table. Shaking his hand could send a signal to Israelis that there is a partner for peace. We are there to support Mahmoud Abbas, the Syrians and the Lebanese to get their territory. We are there in all honesty, if peace is achieved, to pursue that what was promised in the Arab peace plan. That is normalization, after the peace. We are not going to be party to gestures that could be interpreted as normalization before peace is attained. What will the Saudi role be after the Annapolis conference? Saudi Arabia is not looking for a unique role for itself to play. We will not of course negotiate in place of the Palestinians or the Syrians or Lebanese. But we will help in any way that we can if asked by these sides to help. No. Not before peace. We will visit only Jerusalem that is liberated. What is your time frame for reaching a comprehensive peace agreement? The time frame is very clear. It is until the end of the Bush Administration. Of course. Every man on the street and every woman on the street, not only the politicians, knows what the settlement will look like in the end. It just needs the action to bring it about. It looks like the 1967 border, with delineation of that border. It looks for a negotiated solution for the Palestinian [refugees] return. It looks for a return of East Jerusalem as part of the Palestinian territories. And Arab acceptance of Israel's legitimacy as a state?